By Chris Williams: Former two division world champion Mark Johnson (44-5, 28 KO’s) was giving some brutal opinions he had about WBO welterweight champion Manny Pacquiao and the matchmaking that’s been done for him in the past few years in a recent interview with RingTv. I agree. All those god awful catchweight handicap fights Pacquiao had taken part in. The casual boxing fans don’t have a clue about this kind of technical stuff. Johnson thinks Pacquiao has been set up with guys that are over the hill over and over again in the past three years, giving the impression to the casual boxing fans that Pacquiao is better than he actually is. This is kind of thing that has a lot of boxing fans disliking Pacquiao as a fighter. I know it’s not his fault that he was matched against those guys instead of younger able-bodied fighters. But you have to lay some blame on Pacquiao’s lap for the Floyd Mayweather Jr. fight not being made last year when Pacquiao wouldn’t agree to the blood tests for performance enhancing drugs that Mayweather wanted. Mayweather was willing to have a 17 day cutoff of the blood tests but Pacquiao wanted more time than that. The fight could have been made if Pacquiao had given in or the negotiations not abandoned quickly by Arum to match Pacquiao with one of his Top Rank stable fighters Joshua Clottey, who Pacquiao’s trainer Freddie Roach said would make for a more exciting opponent than Mayweather. Some exciting opponent, eh? I agree with Johnson about the Marquez fight as well. Pacquiao and Arum waited three years to finally fight Marquez again after winning a controversial 12 round split decision against Marquez in 2008 in a fight that many boxing fans saw Marquez winning. 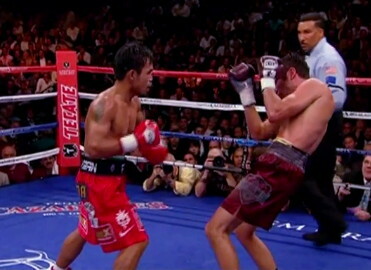 I’m still not sure what made Pacquiao and Arum decide to fight Marquez again after all these years. Who knows? Maybe they figured he was a shot fighter and it safe to fight him. In any case, Pacquiao got dominated and ended up winning another controversial decision that boxing fans completely disagreed with. That fight made Pacquiao look really bad because Marquez was the first really good fighter that Pacquiao had been matched up against in the past three years and he looked really bad. Arum has kept Pacquiao busy fighting his guys, who Johnson thinks are all pretty much shot fighters. The matchmaking for Pacquiao clearly has made him look really good, perhaps a lot better than he would if Arum and Pacquiao had agreed to fight Mayweather earlier.